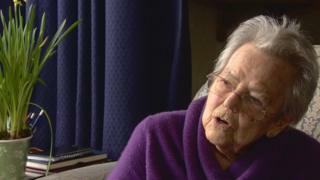 A 95-year-old woman living in Edinburgh has been awarded a medal for her service in World War Two - 70 years late. Patsy Mundie's work was connected to the Special Operations Executive - sending and receiving high speed morse messages from agents. She did not apply for the medal at the time as she said after the war she wanted to wipe the memories away. She described having her medal now as "wonderful." Mrs Mundie's grandson, Simon, set about applying for the medal when he discovered his grandmother did not have one. After initially applying for a job as a driver during World War Two, Mrs Mundie had found herself recruited to send highly secret morse code messages to agents working in occupied Europe. She and her colleagues knew that what they were doing was important as they were not allowed to discuss it with anyone. A single letter, wrongly taken down could have made all the difference. She said having her medal more than 70 years later was "wonderful". She said: "I thought I had had a very ordinary life but other people seem to be interested in it." She added: "We went on this course, which was very highly secret and we were told we weren't allowed to speak about it to anybody. Our cover story was that we were drivers. "Then I had six months training with high-speed morse, it was all code, we didn't know what the messages were and we had to be able to receive and send at 26 words a minute. "We then used to send messages to the agents who were in Germany."